It’s almost 40 years since Patti Smith released Horses – a recording she will perform live in Dublin next Monday. As music, as image, as artefact, Horses stands apart – a repository of Smith’s punk reveries and the deconstructed rock music of her band. The record propelled the poet-singer to stardom, of a sort – as a boho-punk queen who blew aside the machismo that saturated the first generation of rock music. The music on Horses was as direct as the singer’s stare on the front cover of the album. The record itself is full of literary and musical influences, from Arthur Rimbaud to The Ramones, Wilhelm Reich to Them. 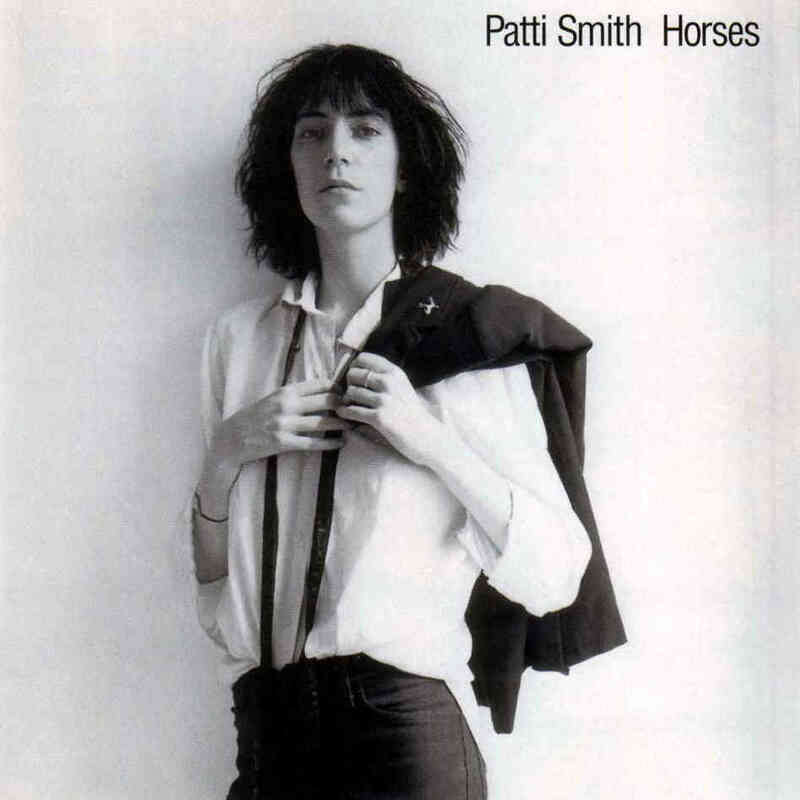 But you can also hear something on Horses that goes back beyond these inspirations, past the iconography, the legend and the acclaim that surrounds the album, to a younger Patti Smith. By the time Horses was recorded, in 1975, Smith had been pursuing her muse for eight years, since leaving her New Jersey home aged 20 for Manhattan’s Lower East Side, by way of Brooklyn. She’d waitressed, attempted to work as a book restorer, been a clerk and a salesperson, all jobs which helped her scratch out a living while writing poetry and painting. Her memoir Just Kids recounts these early, almost always drizzly New York days; and the nights spent in cold-water flats or, at the outset, sleeping in doorways or rough in Central Park. There are moments of bright light too, afternoons spent with her partner Robert Mapplethorpe at Coney Island, evenings in the lobby of the Chelsea Hotel with Harry Smith or William Burroughs. The commitment to writing, the mental persistence of these early days in the face of poverty and doubt and illness, lies at the heart of Horses. Tracks like Land (which paid tribute to Rimbaud) or Gloria (a track which begins with an anti-prayer – “Jesus died for somebody’s sins but not mine” – before reincarnating Van Morrison’s original) stand out on early listens of the album. But its core is the simpler, touching Free Money, a song which gives us Patti Smith before she became the Patti Smith. There are no allusions to French symbolist poets or cries to God here. Addressing her penniless lover Mapplethorpe, Smith instead asks: wouldn’t it be great if we won the lottery? Cash them in and buy you all the things you need. She never did, of course. Instead she pulled her way up page by page, pushing and persisting until she sounded a call which resonated with thousands of others like – and unlike – her. Drudgery, rejection and poverty turned to poetry and music – that’s what makes Patti Smith punk. A little Hank, for the day that’s in it. When my time comes I’ll hope not to have aged badly. 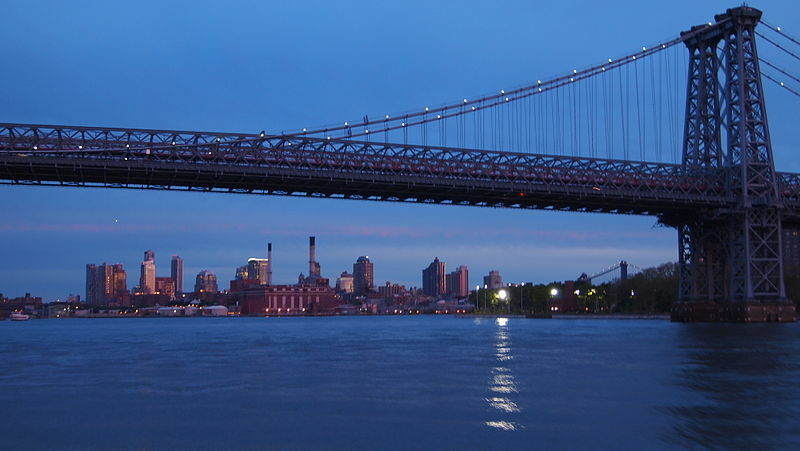 A saxophone player stands and plays for hours on a bridge – the sky above, the Hudson river below. It’s 1959, it’s New York City and the musician is Sonny Rollins. For weeks he’s been walking to the Williamsburg Bridge from his apartment on Grand Street in Lower Manhattan. Once he arrives at his chosen spot he stands and practices, often for hours. Sometimes he brings friends, more often he’s alone. Usually he spends hours blowing, choosing to play on the bridge rather than in the city clubs. 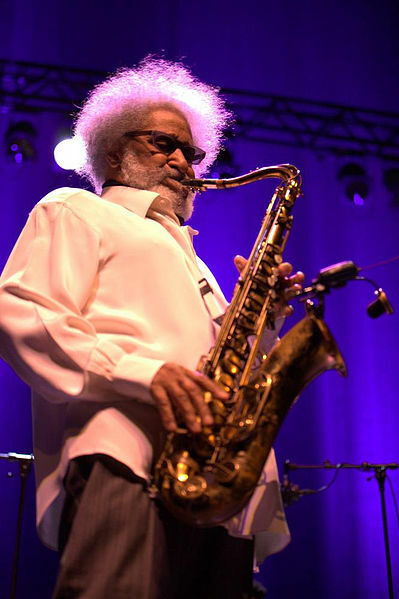 Three years later Sonny Rollins returns to the jazz scene, releasing an album inspired by (though sadly not recorded on) the bridge – and named after it. What did Rollins find during those 15 hour days he spent alone over the Hudson River? Whatever it was, it led him back to the music scene that he had stepped away from, frustrated by his self-perceived limitations. His album The Bridge would be acclaimed by fans and critics. Popular culture, for its part, found something else – a ready-made mythic image, the lone saxophone player practicing over the city, a mid-century outsider urban seer. Rollins’ legend slipped easily into the musical culture of the time – the artist exiling himself to find his muse. There are echoes of the same story in Bob Dylan’s retreat to Woodstock, or Robert Johnson’s disappearing for six months and meeting the Devil at a crossroads, returning with a new take on the blues. But every myth has its roots in the everyday and Rollins’ is no different. 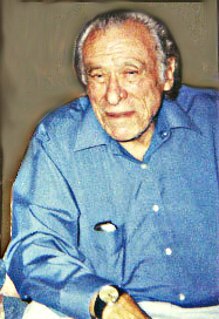 He first set foot on the Williamsburg Bridge by accident, while rambling around the neighbourhood where he lived with his wife, Lucille. And he returned there not to seek the muse, but rather to avoid annoying his neighbours. “The problem was that I had no place to practice. My neighbor on Grand Street was the drummer Frankie Dunlop, and his wife was pregnant. The horn I’m playing, it’s loud. I felt really guilty,” he later recalled. As for his return from the bridge – after two years of daily practice there – the reality was less revelation and more, well, perspiration. And so pregnancy and the daily grind led to a quintessential jazz myth. The next time I listen to The Bridge I should think of Sonny Rollins’ neighbour and his hardworking spouse – the real reasons he walked on to the Williamsburg Bridge one day in 1959. But the myth sounds better. As does the music. At 2pm on August 18, 1962 – a hot, summer Saturday – a 57-year-old man, wearing a dark suit, a pork pie hat and carrying an instrument case, walked into a small building on Sylvan Avenue in Englewood Cliffs, New Jersey. He was early for an appointment but discovered that the man that he was meeting, an acquaintance of decades past, was already waiting. And so Coleman Hawkins and Duke Ellington found themselves in a studio at last – a date which had been 20 years in the making. Ellington, for the record, had arrived early. Over the following next six hours tenor saxophonist Hawkins would accompany Ellington and a small band of Duke’s regulars – Johnny Hodges, Ray Nance, Lawrence Brown, Harry Carney, Aaron Bell and Sam Woodyard – on half a dozen or so songs. This would form the album Duke Ellington Meets Coleman Hawkins. The music was all Ellington, sweet and sharp and singing, but with a strain of melancholy throughout (their take on ‘Mood Indigo‘ is almost mournful). Listening to it half a century later one hears two important figures in American music, if not at the height of their powers then in full, easy command of them. The recording they left on tape that afternoon still sounds and swings as fresh as it did on that August day. We’re lucky it exists at all. The meeting of Duke Ellington and Coleman Hawkins almost didn’t happen – and the background to it shows that even the greats are subject to the perils of procrastination. In an interview published in the album’s liner notes Hawkins told how the album was two decades years in the making. “Duke came to me twenty years ago…and said: ‘You know, I want you to make a record with me, and I’m going to write a number specially for you. Twenty years after Duke’s offer Hawkins was still speaking of the long-fingered plan. After he referred to it in a magazine interview an outside force, legendary producer Bob Thiele, intervened. By petition, cajolement or the promise of a payday he convinced Duke and Hawkins to make the trip across the Hudson River to New Jersey for an afternoon’s work. 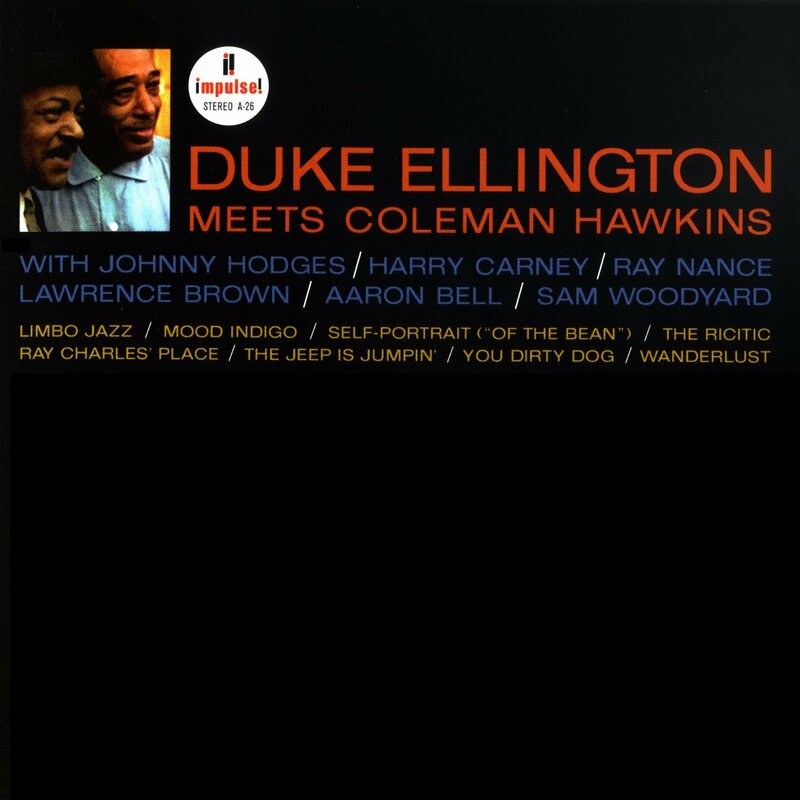 Though their careers ran in parallel for four decades Duke Ellington Meets Coleman Hawkins was their only meeting – a lesson that if something’s worth doing it’s worth doing, even if it takes 20 years to do it. Stanley Dance‘s liner notes recall the pair’s farewell that evening. “”After four hundred years, we made it!” Coleman said. “You don’t think it was too soon?” Duke asked. 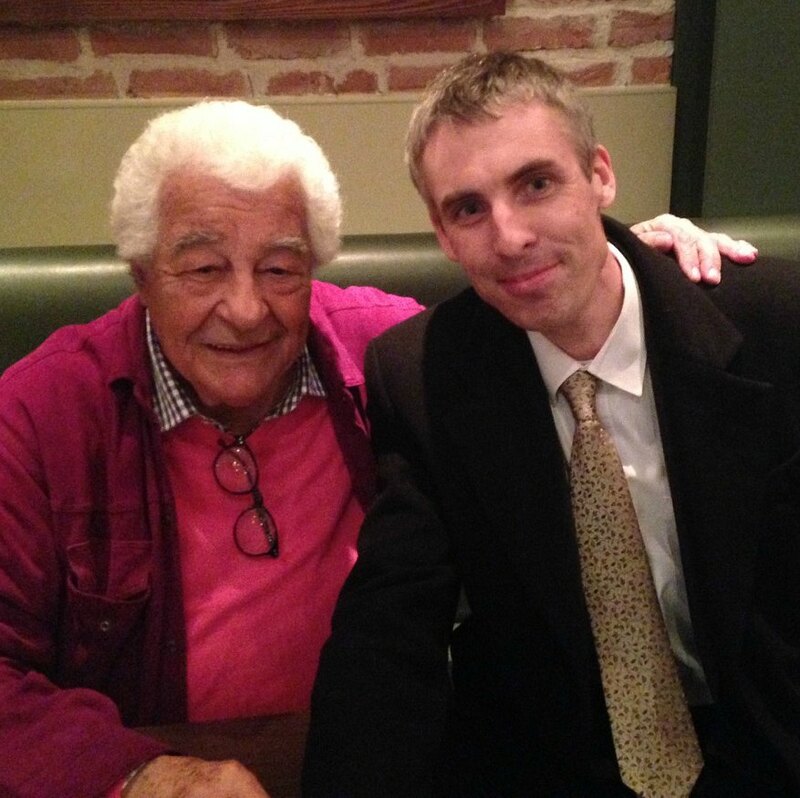 With Antonio Carluccio, Glasthule, April 2015. Antonio Carluccio knows it. 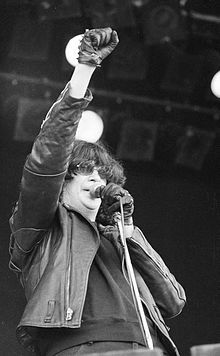 So did Joey Ramone. So did Ernest Hemingway, and Leonardo da Vinci and Frederic Chopin. Simple is best. As Henry David Thoreau put it: “Our life is frittered away by detail. Simplify, simplify”. If only it were that easy. Confronted with vast amounts of information every day the task of refining, digging to the core or even finding it, is not an easy one. Unlike Thoreau most of us don’t have the option of going off-grid to a hut in the woods. We have to engage with the information avalanche. And having sorted through it we then have to utilise the useful bits. I do more of this than most. I work in the communication industry. As a journalist I process large amounts of information every day, filtering it down and then re-communicating the key elements to readers. Books have been written, theses published and academic careers built upon analysing this process – how best to sort through the mound of content and find the ‘news hook’, the golden thread of the new or the interesting. It’s a constant process – as the news cycle changes day to day so must I. After a day of such work I recently had the pleasure of attending an event and meeting Italian restaurateur Antonio Carluccio. I can’t cook like the 78-year-old but I can apply his method to the communication field. In his autobiography Carluccio explains the culinary theory he formulated in the early 1980s. Finding that the nouvelle cuisine of the time amounted to much extravagant kitchen technique Carluccio argued that simple dishes were best. He called his theory ‘mof mof’ – minimum of fuss, maximum of flavour. In content terms this translates to ‘less noise, more nub’. It’s a practice those mentioned above applied to their own respective disciplines, like Ramone’s ‘Hey! Ho! Let’s go‘ or Hemingway’s “one true sentence“. Like those declarations ‘mof mof’ is far simpler in theory than in practice. It requires distillation, refinement and constant revision to get to the purest message possible – to cut through the fuss and find the flavour.